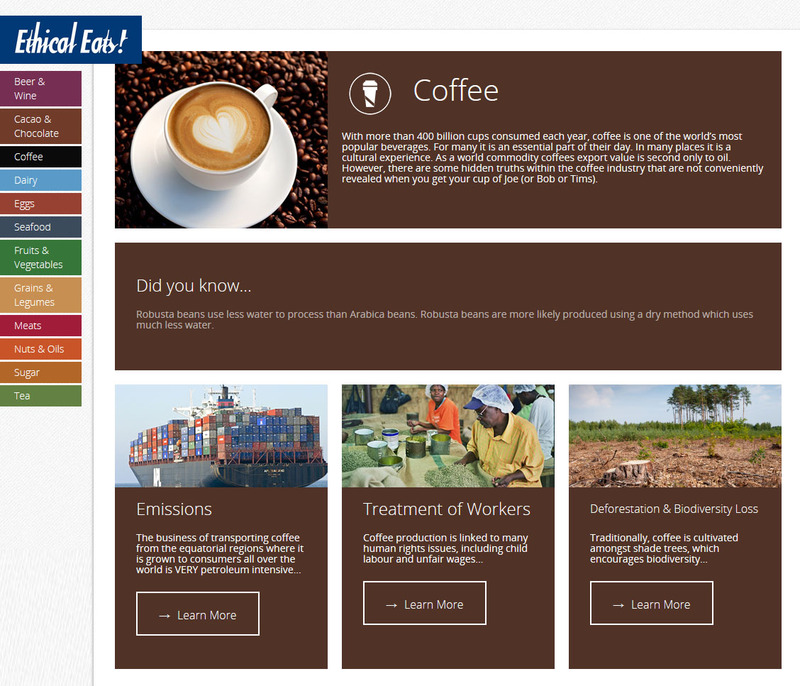 SCIC’s new ethical consumer website and mobile app, Ethical Eats! is now available for iPhone, iPad, and Android. This user friendly app links Saskatchewan consumers with local, organic, and/or fair trade businesses and producers, and has an interactive educational portal where you can learn about global food issues connected to the foods we eat everyday. www.ethicaleats.ca. If you’re a producer or business owner selling local, organic, or fair trade products in Saskatchewan — get listed! Simply click on “add your business” and tell us about your services! Fair trade is an alternative trading model. It ensures that producers receive more for their products than with a conventional trading system. According to Trans Fair, a Fair Trade certification body, “Fair trade seeks to change the terms of trade for the products we buy – to ensure the farmers and artisans behind those products get a better deal. Most often this is understood to mean ensuring better prices for producers, but it often also includes longer-term and more meaningful trading relationships.” Fair trade not only increases the income that these small farmers are receiving, but it also protects their labour and environmental conditions and helps to maintain a concrete relationship between the producer and consumer. There are numerous products that consumers can purchase that are fair trade. These include, but are not limited to, clothing, tea, coffee, sugar, bananas, jewellery, soccer balls, and chocolate! Host a Fair Trade Breakfast! Fair Trade soccer balls can be ordered online, just ask your school, community soccer league, or your parents! Your school could host a tournament using Fair Trade balls and engage both the staff and students! Warm up in your school or classroom by sharing some Fair Trade hot chocolate! Put up some displays about Fair Trade and tell others why Fair Trade is important. Set up a booth to sell Fair Trade clothes, jewellery, hot chocolate, and chocolate. Contact a business like Ten Thousand Villages for the products, and use the money you make to buy some Fair Trade sports balls for your school, or donate the money to charity! Sell the products around Christmas so people can get their shopping done! Get those creative juices flowing and create some art for Fair Trade! Hold a poster contest and ask for submissions to (prizes can be delicious Fair Trade chocolate!). Put up the posters around the school, and display them at a Fair Trade event! Put your modelling skills to good use and show off some fabulous Fair Trade threads! Talk to local fair trade businesses about lending clothes for the show, find some community sponsors, and raise awareness about the importance of Fair Trade in style! Check out the Fashion Show Action Guide from Fair Trade UK, or this Fashion Show Starter Guide from People and Planet UK for some ideas toget started! Encourage your workplace to provide Fair Trade coffee, tea, and sugar, or use Fair Trade coffee and tea at your next community event (pot luck supper, community meeting, church brunch). Leave some information on Fair Trade in the area that the coffee will be served (contact SCIC or Fair Trade Canada for pamphlets or posters).Don’t forget to use reusable cups! Show a film on Fair Trade issues at your community centre, church, school or university, or in your own home! You could also provide Fair Trade coffee, tea, chocolate, or dried fruit, and charge a small admission fee (proceeds going to a Fair Trade supporting organization, or to cover the cost of the snacks). Check out some ideas here or here.